In 1994, Congress began appropriating budget for the first renovations to the US Naval Academy at Annapolis in over 40 years. One of the components USNA base command was extremely interested in addressing in the renovations was the base keying system. The initial appropriations were scheduled to begin with Wing 7 of Bancroft Hall, a 1.4 million sq. foot building which is the largest single dormitory-type building in the world. InstaKey Security Systems was invited to come to the USNA to make a presentation at the time the initial renovations to Wing 7 were scheduled to begin. 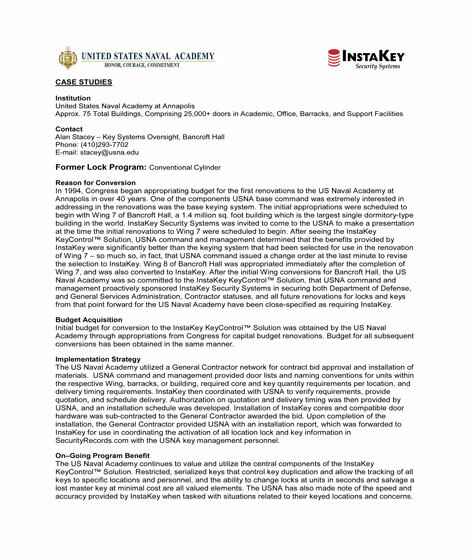 After seeing the InstaKey Key Control Solution, USNA command and management determined that the benefits provided by InstaKey were significantly better than the keying system that had been selected for use in the renovation of Wing 7 – so much so, in fact, that USNA command issued a change order at the last minute to revise the selection to InstaKey. Wing 8 of Bancroft Hall was appropriated immediately after the completion of Wing 7 and was also converted to InstaKey. After the initial Wing conversions for Bancroft Hall, the US Naval Academy was so committed to the InstaKey KeyControl™ Solution, that USNA command and management proactively sponsored InstaKey Security Systems in securing both Department of Defense, and General Services Administration, Contractor statuses, and all future renovations for locks and keys from that point forward for the US Naval Academy have been close-specified as requiring InstaKey.